License: This is a product of Boonexpert. It cannot be redistributed without written permission. see more Single license is for one website only. License: This is a product of Boonexpert. It cannot be redistributed without written permission. This module includes free installation on your server! 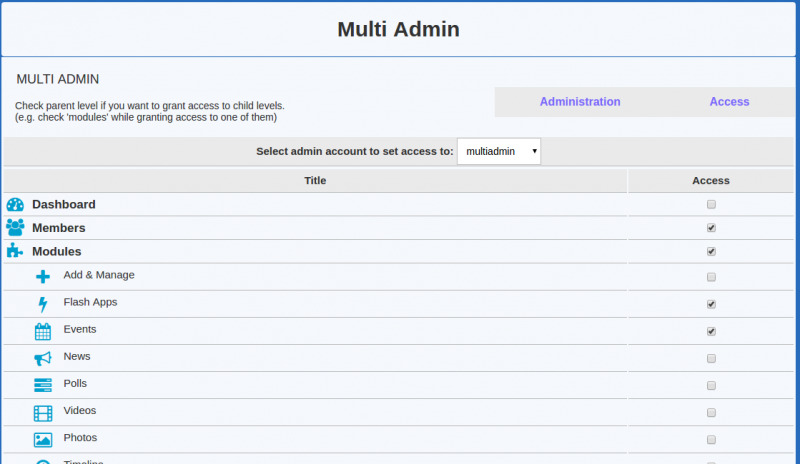 After countless requests for this feature, "Multi Admin Access" is available now! With this module you can easily add temporary or permanent administrators and adjust individual access to certain admin menus or modules for each of them in order to let them work on your website without touching other admin pages. This ensures a higher degree of confidence when you allow others for a specific reason to enter the admin area by keeping your site more secure, enabling you to hide content of your choosing and allowing content displayed of those on a "need to know" basis. The best part of it is that no matter what admin name or settings you grant them, when they sign into the admin panel, they will always see "administration panel" and not "sub-admin user panel". This is perfect module for when you have temporary programmers doing work on your site or for employees you dont want snooping around. If you would like to test this or any other of my modules, just send me a private message and I will provide you personal access to my demo website. If you have any questions or need help with installation, please feel free to send me private message and I'll help you. All our sales are final and no refunds will be given. Please ask all questions and request demo (if available) prior to purchase. As most of our offers are digital services, it is impossible for you to return a service to use for a refund. If you find a bug in our software, you can report it on support email boonexpert@gmail.com and we will fix it in the next version or custom on buyer server. Finding a bug is not a reason to request a refund. However, we understand that it is impossible for us to test our software on every platform and every configuration it may encounter on other servers. Therefore if you are unable to get our software up and running on your server in the first 30 days after purchasing the software then please contact us and we will do everything within our knowledge and experience to get our software to work on your server. Thank you for your comment! I'm happy that you like my modules! have a great day! Works like a charm! Thanks for making this module - I guess Boonex needed to create opportunities for smart developers to create a module for us to buy and send them business. Congrats boonexpert! My $50 was well spent. Very useful mod. I long time wait for this function Boonexpert do it! This feature is Amazing! I'm happy to finally have my moderators feel like they are able to moderate.. Should really be standard with any version of dolphin. Thank you so much for this feature! Thank you also for helping install it! This is one of the rare gems in the market where you can not only add extra admins (maybe your staff or friends) but control or limit their access to certain admin menu items!! Really a great mod and what's even better is the fantastic support given!! Very fast, detailed and most helpful! great module, great support merry christmas and a happy new year! This mod is a need if you want to turn your dolphin site into a real professional site where you goals of achievements are set. Multi admin access is actually not just a module, it's a need within Dolphin :-). We are the founders of our sites and decide the trust we give to other. This mod is pure brilliance, in looks, functionality, and purpose. The absolute must have for any on-line community. I'm having a hard time just typing out the words to describe just how necessary this mod is for me, and it works perfectly. Alex you really put this one together!!! Thanks for all that you do, in developing powerful Dolphin mods like this one. You my friend, is truly becoming a rising star in the Dolphin community. I will be keeping an eye on you. I've wrote you a message but got no replies. I hope you figured out how to install and use my module. Big module! . Thank you very much for all your modules!! This module facilitates me my job, now I can delegate things to different people (somo up newspaper articles). This is a great mod. Great service. Had a weird warning screen that blocked my access in the backend of the site; the developer was good enough to rectify the situation to make sure if worked perfectedly, top man! Not sure if I should mention this here or in the forum. I think it would be great to add restrictions. Like access all 'but'... For example. I would like to give access to the members screen. But I don't want any access to me. It would be nice to restrict that access. Is that see more a workable solution? The warnings was because of wrong installation and not following the installation manual fully. Please write your suggestions as full as you can on the forum. With this module you are no longer alone in control of your site is one of the features that starved to Dolphin. Simple, efficient, nothing to say, it's good work. Also thank you to the seller for assistance in another module. You will always have a quick response in case of problems. I recommend it! I have a very good experience with working with Alex and also recommend him as well. It took a little bit more time then we planed but only because of our unclear wishes. My peace of advice for new customers. If you want the super fast and clear job you have to be very precise with your work assignments. He really cares about his customers and did a great job. I will definitely will work with him again for our website re branding. Excellent mod - Very effective! Highly configurable with the selection of not only the username and password granted to additional admin(s), but also the number of items the admin(s) can access. Every item available on your Dolphin site has it's own check box to select whether or not to grant access to that particular item. Thank you for your review! I'm glad you like it, it encourages us to make more great modules in the future! Installed on Dolphin 7.3.1, and working perfectly. Code changes required to core files. Instructions had incorrect line numbers, but if you know a little about PHP - its easy enough to work it out. Only criticism. 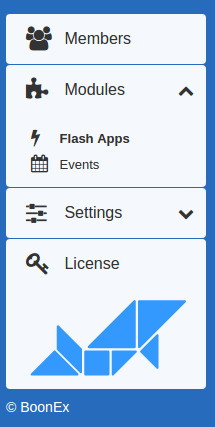 If you have an existing user and you want to make them an admin user, there is no way of doing this via the gui. 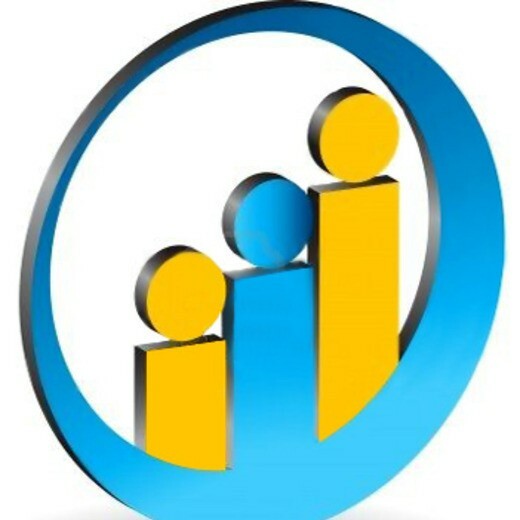 The module only provides a method of creating new admin users. This can be solved with a quick SQL hack. Despite the above, I still thoroughly recommend this module. awesome module for sites with multiple admins, can also be very useful if you need to grant access to specific parts of your admin panel. can only highly recommend this great module! You asked me to help and I've made it work for you. The module wasn't installed correctly on your side. Please don't write negative reviews _before_ asking for help, it really harms developer's account score forever for no reason. iOS mobile app for your site!